Great relationships. They’re the backbone of any business and certainly very much a large part of the growth of PRIME. Truly, it’s probably one of the most important ingredients in the recipe of our successes thus far. That said, it can be really difficult to forge a relationship from a cold call or an elevator pitch. However, there are cases where they start with a simple introduction by a mutual friend. Under those circumstances, it almost feels like the foreshadowing of the ensuing “good fit” type of business relationship. And that is exactly how it worked in this case. A few months ago we were connected to some of the guys at elite by a mutual friend (another one those relationships that become such a positive place in our business – HUGE thanks to Greg McCoy for making the introduction), we were excited for the opportunity to bring PRIME to a new and bigger audience, but we also needed to feel good about what we were doing and who we were doing it with. After our first call with their team, we were all systems go. Our entire team was excited for the opportunity to work with another high-quality US manufacturer. As part of the partnership, customers will now be able to pick up a majority of the pieces featured in PRIME’s RO-T8 Family of products and PRIME’s original Squat Wedges [available in 6 incline option from 5 to 30 degrees]. “These products are the perfect representation of who and what PRIME Fitness is. It is a great introduction to our science-forward approach to development, be it a handle or an arm curl machine. Our mission is to maximize the benefit to users by putting science on their side,” said Jarrad Griffin, VP at PRIME Fitness. 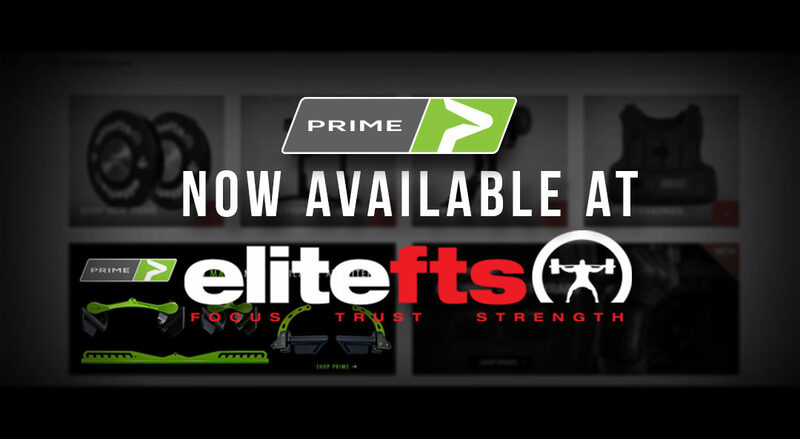 “We feel like this partnership with eliteFTS.com represents a great opportunity to introduce PRIME to a new audience and showcase what the future of science-forward strength training equipment looks like,” continued Griffin. The addition of PRIME falls perfectly in line with what has made elitefts legendary for, being elite. “At elitefts, we always strive to bring our customers the best products in the industry,” said Brian Frantz, Purchasing Director for elitefts.com. “After speaking with the team at PRIME and testing out their equipment, we knew it was a perfect fit for the elitefts website,” Frantz continued. Elitefts.com will carry a majority of the popular PRIME RO-T8 Family of Products and well as the original Squat Wedges. “We are excited to have such a large variety of accessories available at elitefts.com. Our hope is that we can continue to add items as we launch new products in the future. As we continue to develop new products, we will use our own website as the exclusive place for product launches,” shared Griffin.